Coming to Hugh’s Room Live is an intimate tribute by some of the finest musicians from within the city and beyond. Each performer on the ticket will take turns on stage offering up their own stirring interpretations of Joni Mitchell recordings from across her career. 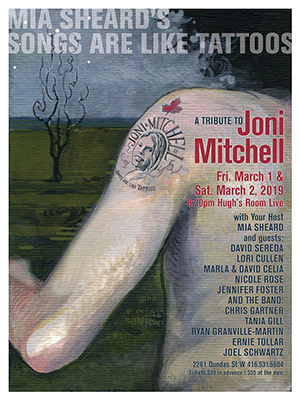 We are overjoyed to announce Tania Gill, Ryan Granville-Martin, Joel Schwartz, Ernie Tollar and Chris Gartner and vocalists David Sereda, Marla and David Celia, Lori Cullen and Jennifer Foster will all be gracing our room with their tribute to Joni Mitchell. Get tickets for Friday and for Saturday.